The penultimate week of the Big Issue Online Journalism course had us writing features, a nice progression from having already covered News-In-Briefs, news stories and case studies. The course really has been quite superb, and very well instructed. Personally speaking, doing some primary journalism and learning those skills has been invaluable and hopefully will be reflected in the increasing quality of my output. Week 5 saw me interviewing Richard Hearn, the young founder of a new east London social enterprise called Generation Me / Generation Hackney. Here are the fruits of my labour. 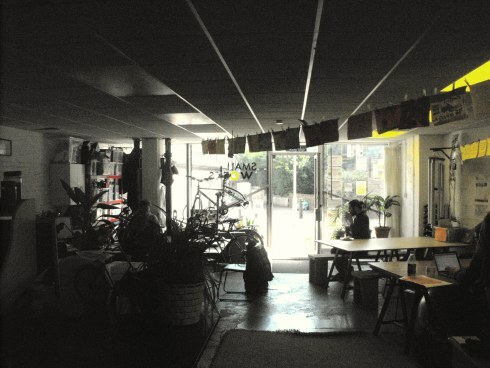 The thirty-year-old founder of Generation Hackney rises eagerly to greet us as we arrive, picking his way forward through the studio he shares with an eclectic mix of social entrepreneurs earnestly tapping away on laptops, sipping coffee or mending bicycles in the corner. From his hotdesk in Hackney, armed only with a MacBook, a mobile phone and his unshakeable optimism, Richard Hearn is trying to improve the lives of disaffected school-leavers struggling with the transition from education into work. “I left my job [working as a volunteer mentor coordinator for a large charity] in November and just went for it. And this is where I am now,” he explains. Previous Article The BBC, Impregnable Fortress of Conservative Bias?